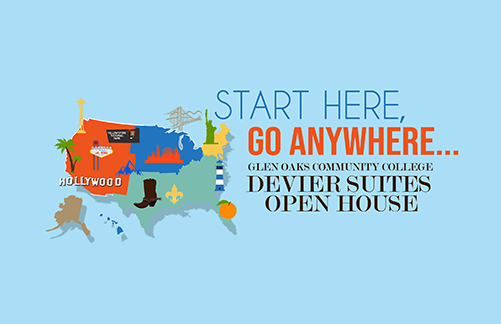 Glen Oaks Community College will host an Open House for the Devier Student Suites on Saturday, April 13, from 1 p.m. to 4 p.m. The event is themed “Start Here, Go Anywhere.”“This is a great opportunity to tour the new facility,” said April Yost, director of housing. “The 106-bed facility offers both two- and four-bedroom suites, each with full kitchen and furnished living area. Other amenities include a lobby fireplace, study and meeting spaces, a laundry room and free WI-FI. Refreshments will be provided with foods from around America to go with the event’s theme. Representatives from Admissions, Advising and Financial Aid will be on hand and available to answer questions from academic programming to financing one’s education. Glen Oaks is located at 62249 Shimmel Rd. in Centreville, MI. The event is free.